The new release is out with one major new feature – support for Jira Server. Finally, integration is possible through username and password from the Settings page. Jira Cloud has support for the Next Gen projects field “Story point estimate”. Additionally, this release opens a lot new possibilities with time estimation and ad-hoc voting. The Integrations tab of the Settings page now has the ability to connect to Jira Server using username and password. The password is entered where the token field is located for Jira Cloud. The Scrumpy Planning Poker is now smart enough to detect if it is connecting to Jira Cloud or Jira Server and properly authenticate. Just specify your username and password for Jira Server and the application will be able to integrate with Jira Server. 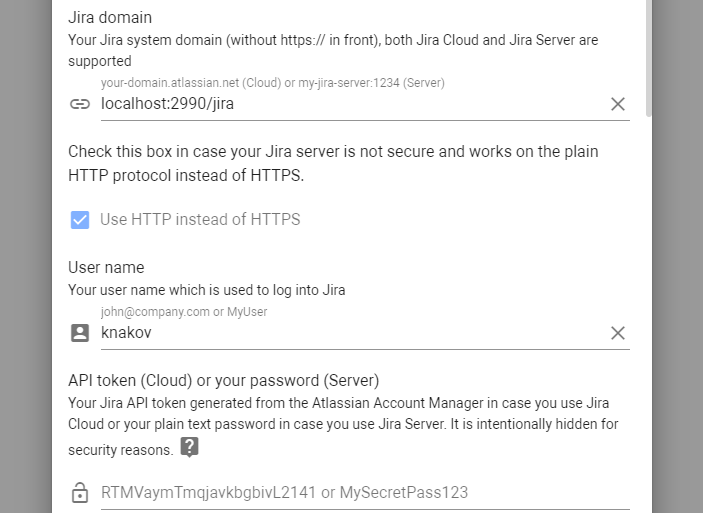 Briefly, use API Token for Jira Cloud and your password (plain text) for Jira Server. The special check box called “Use HTTP instead of HTTPS” is used to communicate with Jira Server using insecure protocol. Although this is not recommended, some instances run insecure. There are new agile projects in Jira Cloud which have the Story point estimate field by default. This field was so far not updated by the application. Now we’re updating it. For some users the L/XL/M/3XL etc. cards were a bit confusing. Now there is an option to add a label for each card with the custom mapping value. This can be either story points according to the custom mapping table or time in case the story point to time mapping is activated. Additionally, the participants votes are displayed as values (1.1w, 5.6h, 42, etc.) instead of L/XL when using values is preferred. Same goes to the results in the left pane. When the story point to time mapping is configured in the Settings page, the card labels, user votes and results are displayed using time instead. The format of the time is 2.5h (hours), 4.7d (days), 1.2w (weeks), 4.4m (months). This is particularly useful for projects using time estimates. Note: that when using time estimates, the Jira Cloud/Server stories are updated with time too. This can happen though if only the project to which the ticket belongs is properly configured to use time estimate instead of Story Points or Story point estimate. Make sure those fields are removed from the edit screen of projects that use time estimates. When using presets, some stories can be estimated with time, some with points. This is another major improvement in the latest version that allows to estimate with time not only with T-Shirt, but with the other card sets. Additionally, this option is available not only to Jira users, but to all our customers. Time estimate is enabled only when the mapping between story point and time is configured in the Settings page. When using time estimates with Jira integration, it’s recommended that the Jira project to which the ticket belongs is properly configured to use time estimates instead of story point estimates. Otherwise the stories will be updated only instead of the time. The time estimate can be part of any card preset so for some stories it is possible to have a different story point to time mapping. This is particularly useful when estimating stories from different teams, or there is specific overhead for some set of stories that needs to be reflected. Time estimates work well with card labels (values) and T-Shirt cards. On each card there is a custom mapped value displayed. The value is calculated as the card story points multiplied by the time mapping in hours and converted to the shortest representation of time, e.g. 1.1w if more than 5 days. This is kind of free ride with voting as it allows to vote with any arbitrary value. The free scale voting can work equally well on story points as well as on time. Certainly, as all the other card set settings, free scale voting is available in the card presets. 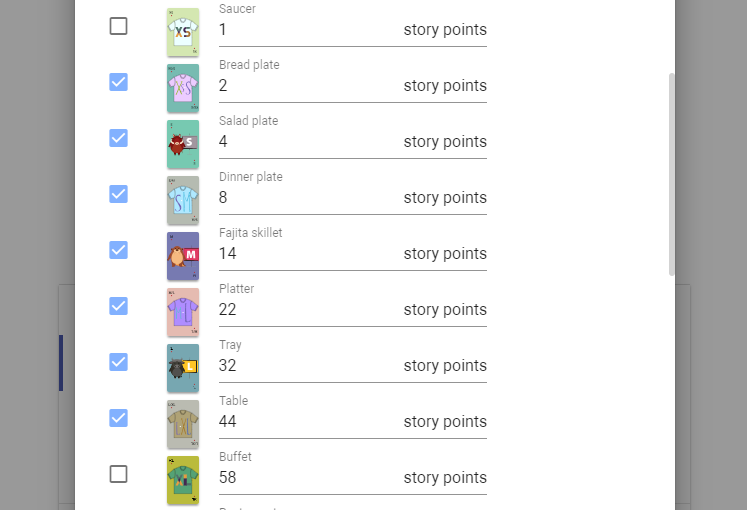 When using free scale, the minimum and maximum story points form the T-Shirt mapping scheme are used to determine the size of the scale. In case you don’t see the large numbers on the scale, please make sure that the big values in the T-Shirt story points mapping is enabled and properly set. 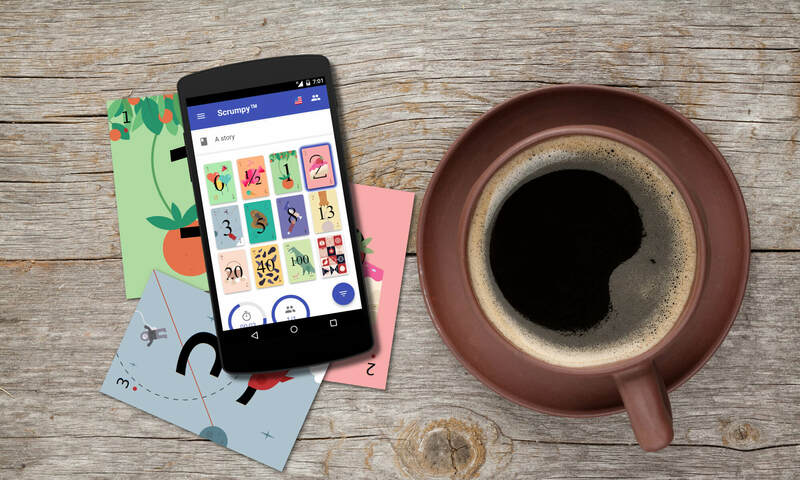 For example, in the image below the minimum scale value is 2 and the maximum is 58 (assuming that all cards above 44 are disabled). After the min/max scale ranges are configured, it is time to finally display the nice new voting window that allows arbitrary points or time estimates. The step when voting with story points is 0.5 so that 18, 18.5 and 19 can be selected by sliding the thumb of the slider. The voting widget also displays the currently selected estimate as well as the overall complexity of the task. The more time it takes, the more complex it is. When you move the thumb to the rightmost side, it will show 100% complexity. The color of the thumb and the circular progress bars change with the complexity of the ticket. It starts from green color for the least complex tasks and and goes to red color for the most complex. The – and + buttons on the two sides of the slider can be also used to move the thumb one step (0.5) to the left or to the right. Note: after the value is properly selected, you need to press the Vote Now! button. If you don’t press it, your vote won’t be regarded. The more you vote with different estimates, the more the vote uncertainty will decrease. The voters and summary sections will display the certainty level as when voting with the regular cards. When the story point to time (in hours) mapping is configured to non-zero value, the time estimates become active. 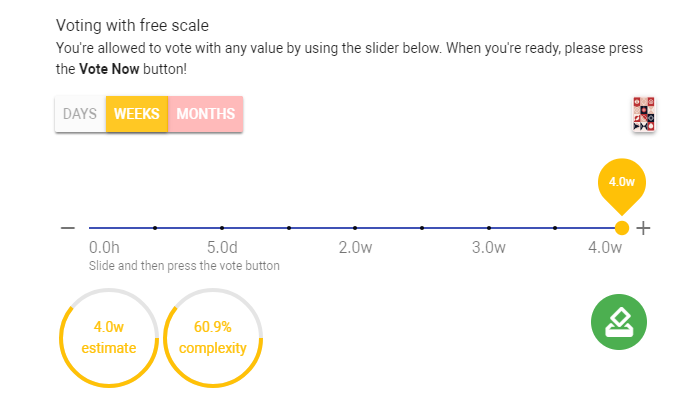 The free scale voting gets one more extra sub-widget to select the time scale for easier voting with less slides and convenient estimate. This widget appears on the upper left corner of the voting screen. Additionally, the extra cards are also displayable from the upper right corner. Still, you can vote to rest, have a snack or indicate no idea what’s going on or emphasize the complexity by voting with infinite estimate.